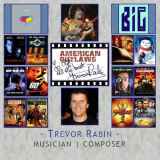 Trevor Charles Rabin is a South African-born musician, songwriter and film composer. As a musician, he is best known for his time as the guitarist and vocalist for British progressive rock band Yes from 1982 to 1994, when he left the band to pursue a film composer career. New Response (Success): Sent 1 8x10, 2 5x7, photos, backing plate, from H..